T-minus eighty minutes until the annual Christmas bash. I’m left wondering whether this year’s events will be most like the year I had to drive a drunk foreign exchange worker home, the year my college roommate drilled the Christmas tree to the wall with a power drill, or the year the dog got drunk and pissed the bed. The thing about volunteering to watch someone else’s children or dogs is that it is one of those unique favors that can end up with the favor-doer indebted to the favor-asker should anything go wrong. It is with profound appreciation, then, that I thank the twoladies for their graciousness this weekend. No worries, and no pressure. But you should know that there is pressure. 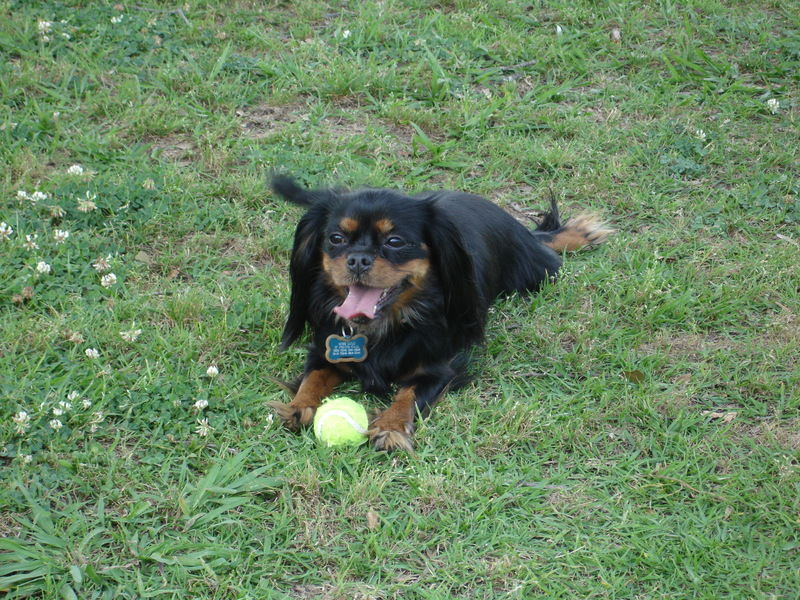 We have, for a little over three years, been the proud parents of one Ms. Lulu – a twelve pound black-and-tan Cavalier King Charles Spaniel. She is happy and effusive and loving of all people, though a bit nervous around bigger dogs. 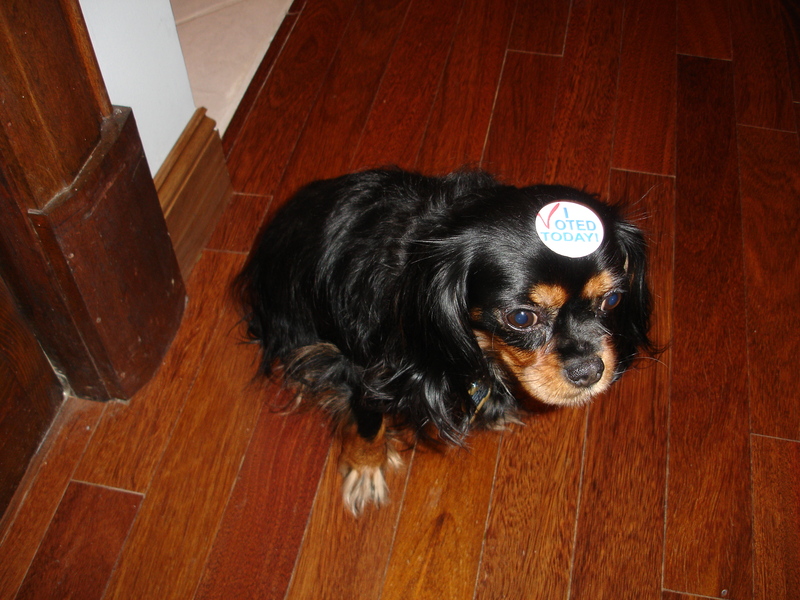 She is also very civic minded, and took this year’s primaries very, very seriously. Lulu is a dream of a dog. She sleeps late, loves playing fetch, and goes to barbecues and Christmas parties. Save for one incident involving an accident on a friend’s white carpet, she is always the perfect guest. After many years of debate (read: nagging), I gave in and agreed that it would, in fact, be nice for Lulu to have a companion while we are at work all day (though I’m pretty sure that she’s perfectly happy without one, what with the TiVo and Playstation available). My wife managed to track down another Cavalier named Tully in western Pennsylvania. She is a rescue dog, having been saved from an Amish puppy mill by a nice family that does this (rescues dogs) as a much more socially conscious hobby than my own. 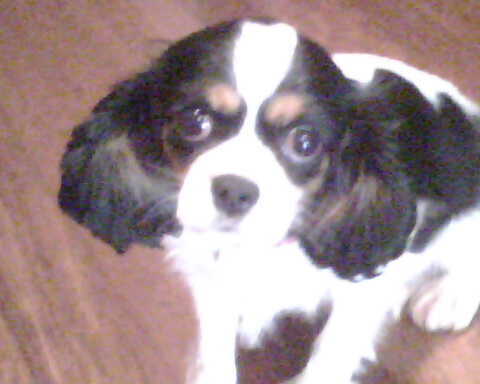 We drove out to PA to pick up Tully last night; she is a beautiful dog as well (you’ll have to excuse the quality of the picture below, I am sans camera this weekend). Tully is also three years old, but has had a much different life experience than our lovely Lulu. You see, Tully spent the past three years living in a wire bottom cage in an Amish puppy mill. She was bred (we don’t know how many times), and unloved, and made to live in a wire box not much larger than her own small frame. For three years. While Lulu fetched in the park, Tully sat in a cage. While Lulu went to parades and played with children, Tully sat in a cage. When Lulu stealthily devoured a wedge of Manchego cheddar at one of our cocktail parties, Tully was sitting, sullen and alone, in a cage. It is, in a word, unconscionable. She is skittish and afraid and nervous around people. She is unsure of how to do basic things, like walk up steps or eat a dog treat. She frequently flinches and is constantly on alert. I take some solace in the fact that she seems to really like Lulu and she wags her tail when you squeak a dog toy. We now begin what I expect will be the long process of socializing this dog and making her feel comfortable and safe in our home. I encourage you to stop by and meet Ms. Tully if you live in the area; perhaps you’ll find yourself washed over with an intense mixture of love, pity, and anger as I do. There are no jokes in this post, except maybe the fact that these horrible, awful people who did this thing to this beautiful, innocent creature are Amish, and perhaps the joke is already on them.